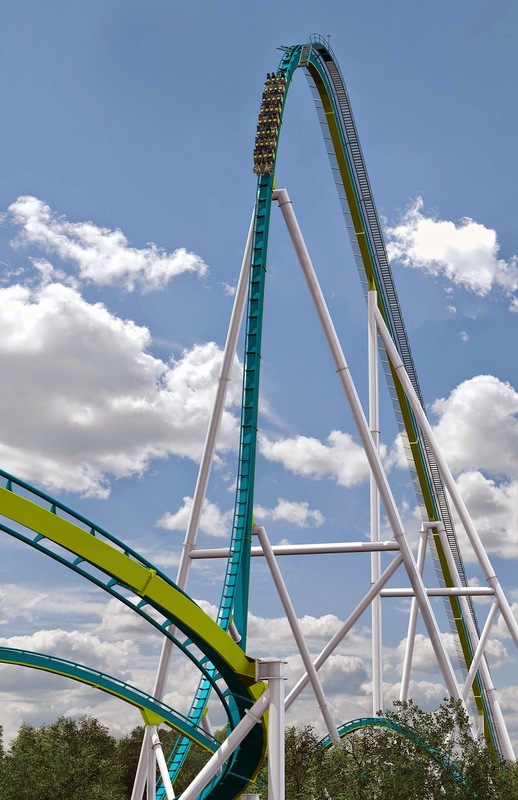 Carowinds announced today Fury 325, the World's Tallest and Fastest Giga Roller Coaster (A Giga coaster is one with a height between 300-399 feet). The ride will feature an 81 degree, 95 MPH first drop along the teal and lime green striped track. Located in the soon-to-be renovated Carowinds entrance plaza, the 6,602 foot long steel behemoth will wrap above and under guests as they enter the park. Fury 325 will simulate the wild, daring and spontaneous flight of the hornet. The new ride will be visible from uptown Charlotte, renewing the park's skyline and serving as a symbol of changes to come. Fury 325 is part of a planned $50 million dollar multiyear investment to bring new life to founder Pat Hall's original vision for Carowinds. The park will be revamped from top to bottom to celebrate Carolina culture including new rides and attractions, signature Carolina food offerings and entertainment. 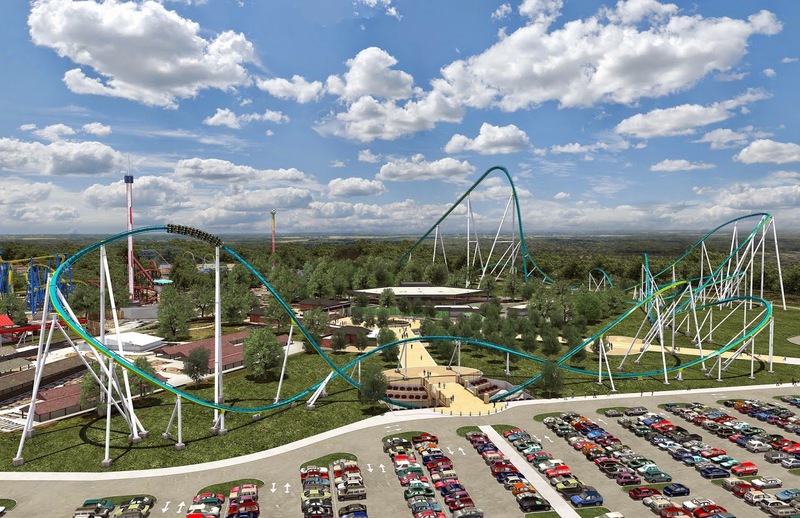 Opening in Spring 2015, Fury 325 will be the centerpiece of a new 8.2 acre main entrance plaza that includes a state-of-the-art ticketing and season pass processing area and expanded guest service facilities. "Starting with Fury 325, we plan to make Carowinds a destination for thrillseekers to celebrate the Carolinas," says Mike Fehnel, Carowinds Vice President and General Manager. "The new ride will build on the heritage of the park, creating new memories and traditions for our loyal fans and future guests from around the world." Riders will board into three 32-passenger open air trains and begin their ascent to the top of a 325-foot (over 30 stories) hill. This immense hill is followed by an exhilarating 81 degree first drop. 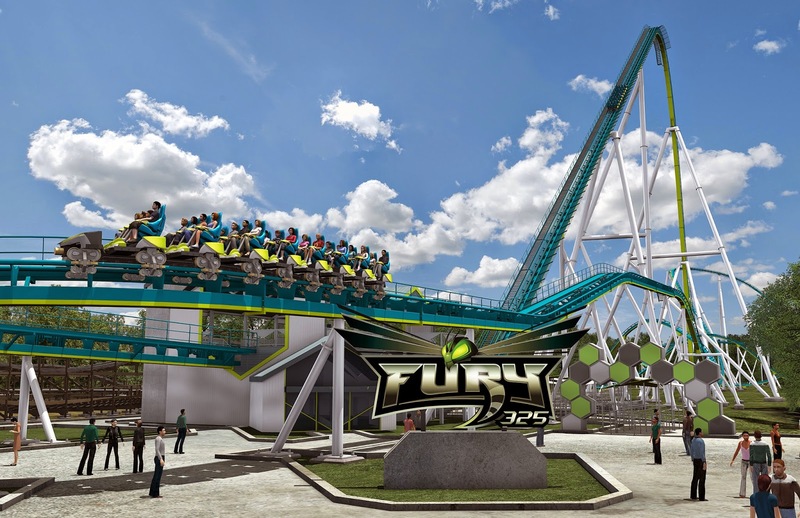 Like an angry hornet chasing its target, Fury 325 will race through a series of hills, curves and quick transitions while reaching speeds of up to 95 miles per hour. Riders will speed along 6,602 feet of track during the nearly three and one half minute ride. This will definitely be a highlight of the 2015 Amusement Park season, and we're very happy for Carowinds and their new addition! That's all for now from TPO. Make sure to "LIKE" our Facebook page to get Exclusive Photos and the Latest News delivered right to your inbox! www.Facebook.com/ThemeParkOverload My name's Nicholous, and Thanks for Reading!